From Extrawheel in Poland comes a trailer that is so simple, it’s kind of brilliant: The Extrawheel Voyager Bike Trailer as one single full-sized wheel that tracks close behind your bike, with carrying capacity on each side and on top — like having two rear wheels. Extrawheel is a small company started in 2005 — but they like to trace the roots of innovation back to Paleolithic times when cave dwellers in Poland innovated tools out of mammoth bones. Great for off-road or road use, this trailer handles easily. Carry most models of Bike Panniers, and with an optional upper rack, you can carry a duffel or dry bag. It’s also like having a spare wheel that does more than wait for an emergency. 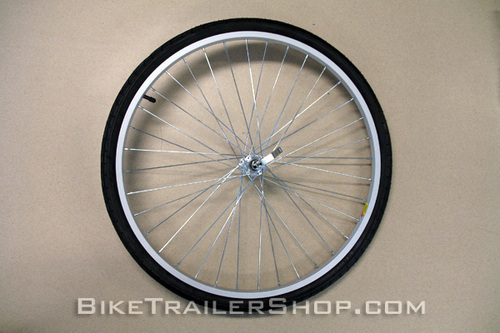 The full size trailer wheel can replace your bicycle’s front wheel in a pinch and keep you rolling. We carry extras like waterproof bags and cargo nets to keep your cargo dry and in place on muddy and rocky trails. And for guerrilla advertising, there’s the ExtraWheel Advert Bike Trailer, which is designed grab attention rather than carry cargo.